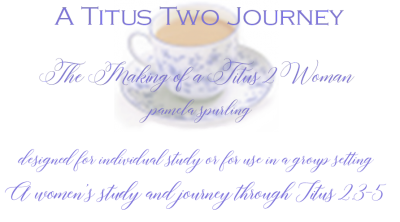 A Titus-2 journey for women: the making of a Titus-2 Woman. Thank you for your interest in studying the Scriptures with a desire to learn more about His design and calling for women of all ages. I wrote this study many years ago and have been grateful for the opportunity to share it with many women through the years. I hope this newly updated and revised version of A Titus Two Journey will be a helpful study guide you (and/or your study group) and will be springboard for conversations and, hopefully, an incentive for a more in-depth personal desire to study the Bible and life-application. Most of all, I pray the Lord will receive all the glory.